Before importing a 3D object, you must consider the scale factor to use. You can calculate the appropriate scale factor for a 3D model by comparing the measuring units used by Storyboard Pro to the ones used by your 3D modeling software. This can be done by importing a cube that is 1 unit in size, cubed, in your 3D modeling software, into Storyboard Pro. Then, you can adjust this cube's scale factor until it matches a unit in Storyboard Pro. To be able to match the size of the cube against a unit in Storyboard Pro, you can enable the World Grid, which is a lot like a standard 12 fields grid, except its fields are square-shaped, whereas units in Storyboard Pro are typically shorter vertically than horizontally, to match the 4:3 aspect ratio of legacy standard displays. In your 3D modeling software, create a cube that is 1 cubed unit in size (a cube that is 1 unit in width, 1 unit in height and 1 unit in depth). In the Library view of Storyboard Pro, select the 3D Models library. Right-click in the 3D models list and select Import Files. In the file browser, locate and select the 3D model containing the cube. In the Library view, right-click on the imported model and select Set Scale Factor. The Model Properties dialog appears. In the Scale Factor field, verify that the model's scaling factor is set to 1.0. Drag and drop the model into the Stage view. The cube appears in the centre of the stage. In the top menu, select View > Grid > Show Grid or press Ctrl + G (Windows) or ⌘ + G (Mac OS X). The default grid (the 12 Field Grid) displays over the 3D model in the Stage view. In the top menu, select View > Grid > World Grid. The 12 Field Grid is replaced by the World Grid in the Stage and Camera views. In the Layer panel of the Stage view, or in the Layers view, right-click on the layer for your 3D model and select Wireframe. While holding Ctrl + Shift, click and drag on the Stage view to rotate it, so that you can clearly see how the cube's vertexes align with the grid. In the Library view, using trial and error, adjust the 3D model's scaling factor so that its corners touch the points (-1,1), (1,1), (-1,-1) and (1,-1) of the world grid, which are identified with a hollow 1. 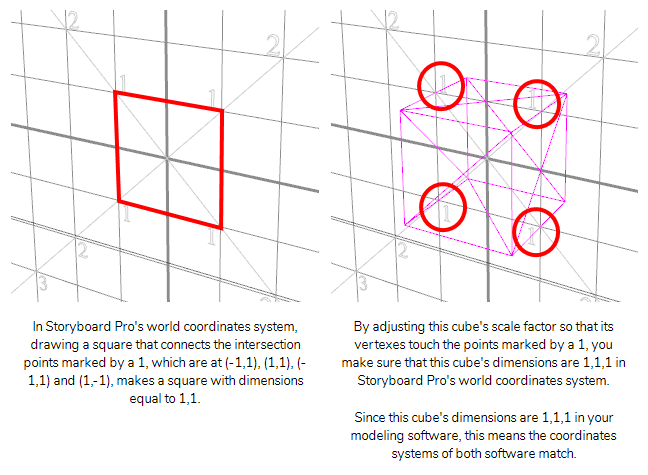 Once you get the cube's size to be 1,1,1 in Storyboard Pro's coordinates system, you can use the scaling factor you applied to this cube onto your other 3D models to make their coordinates systems match Storyboard Pro's coordinates system as well.